Pyongyang warns it will attack propaganda loudspeakers if they aren’t turned off by Saturday afternoon. The two Koreas traded threats on Friday following a brief exchange of fire a day earlier, in a confrontation that experts say is unlikely to lead to war but carries a risk that inexperienced North Korean dictator Kim Jong Un will provoke South Korea into a major military retaliation. The standoff is the first major test of Mr. Kim’s ability to handle a military clash with South Korea. Thursday afternoon, North Korea launched rockets into remote areas over the border, and South Korea responded by firing what it called “dozens” of artillery rounds at North Korean bases. North Korea has threatened attacks on loudspeakers along the border that blast South Korean propaganda at the North unless the speakers are turned off by Saturday afternoon local time. Seoul continued its broadcasts Friday and gave no indication it would meet the North Korean demand. 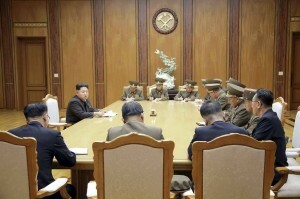 Mr. Kim, believed to be 32 years old, took power in North Korea at the end of 2011. He is frequently shown in state media directing military drills and rocket launches. But his ability to manage military engagement is unclear. Frequent changes in top military staff have also raised questions among outsiders about Mr. Kim’s strategic goals. North Korean state media reported that Mr. Kim chaired a meeting of generals late on Thursday night and ordered the military to be on a “semi-war state” from Friday. The stakes for Mr. Kim have been raised since South Korea loosened its rules of engagement to allow quicker, more powerful responses to North Korean aggression. The shift came after a 2010 North Korean artillery attack on a South Korean island that killed four people and led to the resignation of South Korea’s defense minister, under fire for a weak response. South Korea’s military said in a letter to the North Korean side on Friday it was prepared to “strongly retaliate” to any further attacks. “Both sides are playing with fire in this crisis,” said Go Myung-hyun, a North Korea expert at the Asan Institute for Policy Studies, a Seoul-based think tank. North Korea’s tactics so far appear to come from a military playbook it has used successfully for decades. Its attacks are often calibrated to maximize fear but avoid a descent into a major conflict its inferior military can’t win, experts say. Thursday’s shells from the North landed in a remote area, so causing no loss of life—but generating concern in South Korea that further violence could follow. Setting the Saturday deadline is also a familiar Pyongyang gambit to increase anxiety and widen political divisions in South Korea. With neither side showing signs of backing down, the question now is whether the confrontation will escalate.